The Hollywood Riviera is one of my favorite areas of the South Bay. It offers great views, a small town community feel, ever present ocean breezes, and homes that generally fit on the lots (no McMansions) which make for a feel that you don’t often get in the overcrowded South Bay. It’s hard to go wrong with any location in this coastal community but there’s one street that beats them all. Paseo De La Playa offers oceanfront living for the lucky few and enjoys the best of all imaginable views. 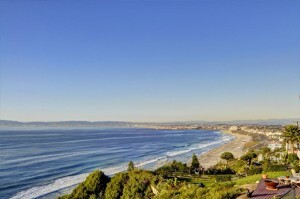 The homes sit up on a bluff, and enjoy views of Palos Verdes, panoramic ocean views, and coastline views from Redondo Beach all the way to Malibu. What that makes for is ever changing, always impressive views. During the day it’s all about the ocean and coastline, but in the evening when colors change, it becomes a fantastic city lights view along the coast. The lots, as seen below, are huge and usually in the 20,000+ range although may are on leased land often with an option to buyout the lease every few years. Depending on how high on the hill you are (lower elevation homes on towards the left above) there is sometimes direct beach access from the homes which dramatically increases the appeal as “RAT” beach (Right after Torrance) is just below and almost serves as a private beach as access is limited to a fairly long walk from the parking lot. Homes on this street rarely become available and many are still in fairly original condition with original owners from the 1960s (honestly why would anyone want to move) and range anywhere from the low $3,000,000s- to well into the $4.0M’s for anything remodeled, especially with beach access. Adding beach access, if not already there, is a huge struggle as it’s tightly regulated by the California Coastal Commission. The only minor inconvenience to living on Paseo De La Playa is that it’s a moderately busy street and a frequent route for both cars and bicyclists going between Redondo and Palos Verdes. There is one condo complex at the top of the street called Cote D’Azure with 87 units perched high on the bluff surrounding extensive grounds and pools. The units are 2 bedrooms generally ranging between 1300-1550 square feet. Many units do not sit oceanfront and have limited views, while the rare few offer similar views to the SFRs just down the street. Overall the homes on Paseo De La Playa offer some of the best features imaginable for those looking into the epitome of California coastal luxury living. For information on current homes contact us or fill in the form below and tell us you’re interested in this wonderful street.